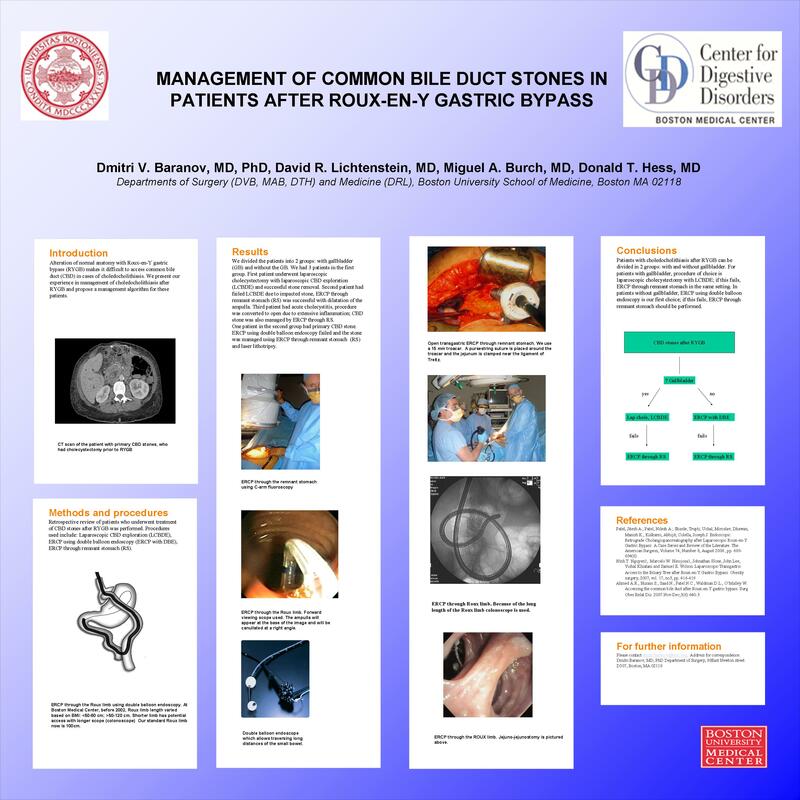 Management of Common Bile Duct Stones in Patients After Roux-en-Y Gastric Bypass. INTRODUCTION: Alteration of normal anatomy with Roux-en-Y gastric bypass (RYGB) makes it difficult to access common bile duct (CBD) in cases of choledocholithiasis. We present our experience in management of choledocholithiasis after RYGB. The purpose of the study was to develop the management algorithm of choledocholithiasis in patients after RYGB. METHODS AND PROCEDURES: Retrospective review of patients who underwent treatment of CBD stones after RYGB was performed. Procedures used include: laparoscopic CBD exploration (LCBDE), ERCP using double balloon endoscopy (ERCP with DBE), ERCP through the remnant stomach (RS). RESULTS: We divided the patients into 2 groups: with gallbladder (GB) and without the GB. We had 3 pts in the first group. First pt underwent lap chole with LCBDE and successful stone removal. Second pt had failed LCBDE due to impacted stone, ERCP through RS was successful with dilatation of the ampulla. Third pt had acute cholecystitis, procedure was converted to open due to extensive inflammation; CBD stone was managed also by ERCP through RS. One pt in the second group had primary CBD stone. ERCP using DBE failed and the stone was managed using ERCP through RS and laser lithotripsy. CONCLUSIONS: Pts with choledocholithiasis after RYGB can be divided in 2 groups: with and without GB. For pts with GB, procedure of choice is lap chole with LCBDE; if this fails, ERCP through RS in the same setting. In pts without GB, ERCP using DBE is our first choice; if this fails, ERCP through RS should be performed.